Yap Divers was established in 1986 by Scuba Diving Hall of Fame dive pioneer, Bill Acker. Yap offers travelers a very special experience with clear warm water diving with an exotic island culture in an uncrowded and undeveloped tropical setting. This is where the modern world mixes with ancient traditional people in an unspoiled paradise void of mass tourism. 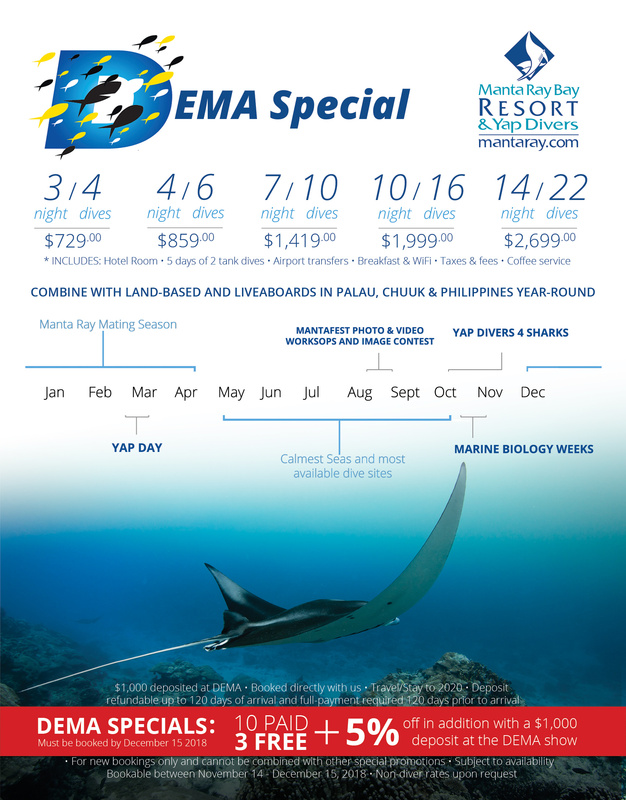 Less than 1,000 divers a year visit Yap, offering travelers outer reef diving in small groups on exclusive dive sites in the world’s first manta ray and big animal sanctuary. Pay 10/bring 13 divers. Applies to both 2019 and 2020 bookings. Cannot be combined with other special promotions and bookable between November 14-December 15 2018. Only for tour operators that exhibit at DEMA.